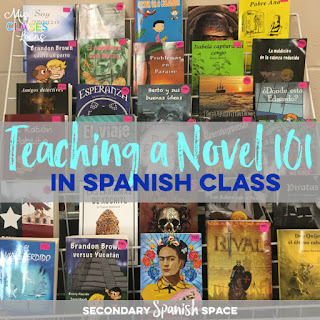 The idea of teaching your first novel in Spanish class can be pretty scary. It was a big change of mentality from the textbook and thematic units I used my first two years teaching. 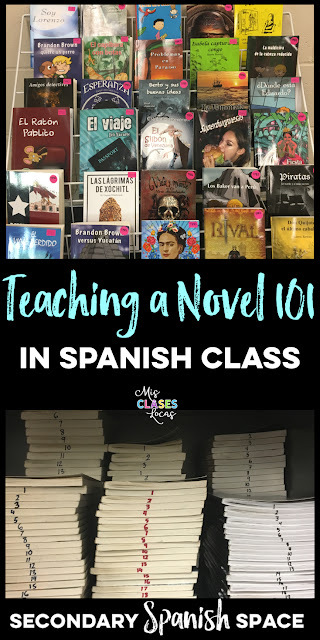 During the 2013-2014 school year, I wrote and was awarded three separate grants to buy books in Spanish for my Classroom Library and multiple full class sets of novels. (If you want to know more about writing grants see here). In the fall of 2014 I started using novels as the center of my comprehensible input classroom curriculum, and have done so ever since. I do not claim to be an expert, but since the majority of what I do revolves around novels I have a ton of posts labeled novels on Mis Clases Locas if you have some time to dig. Since you are busy people, I will try to put everything together here for how to teach a novel in Spanish class 101. If you are interested in teaching with novels, the first thing to do is read as many as you can get your hands on to see what would interest your students. 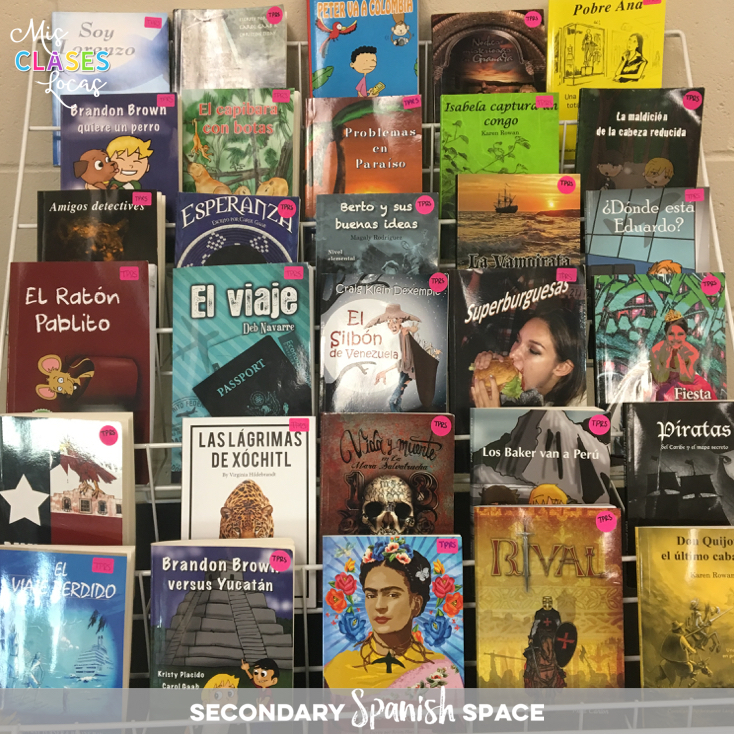 Check out Fluency Matters, Mira Canion, Spanish Cuentos, TPRS Books, One Good Story, and other independent publishers of novels for language learners. Many of these publishers have sample packs of books that can be purchased, or sample chapters to read before you buy. Bryce Hedstrom's ranking the novels, while a few years old, gives an idea of difficulty for some popular novels. Finally check out Mike Peto's CIreading site , which puts together hard to find independently published novels for language learners. Once you have read a few novels, you need to decide how you want to teach it. Here are a few popular options. Free Reading - If you have a variety of single copies of readers, free reading is a low risk way to start with novels. Starting second semester of Spanish 1 my students start class on Tuesday and Thursday with five minutes of free reading in Spanish. This time gradually increases until they are reading for 10-15 minutes in upper levels. In my classes, there is minimal accountability with the expectation that students spend the whole time reading in Spanish. Individual Novel Study - To expand free reading even deeper in upper levels when I only had one copy of each book, I implemented an individual novel study. This would also work well for upper level independent study or expansion for high flyers. Literature Circles - Generally literature circles involve groups of 3-5 students each reading the same book. I have done literature circles in Spanish III and IV. Many upper level students really enjoy the freedom and choice that lit circles provide. One of the biggest roadblocks to transitioning to teaching with novels is money. At the same time it is so important to value the authors who write these books and the copyright and to make sure to buy physical copies for each student. Most publishers offer discounts for class sets of 25. I would make sure to have at least one copy for each student in your largest class. Even when I read to the students, I want them to be able to follow along with their own copy. Here are sources of funding that have worked for myself or other teachers I know. To see them in more detail see this post. Ask your school. Instead of buying textbooks, I used my curriculum money last year to buy many novel sets and the accompanying teacher's guides. Write a grant. There is money out there, Just APPLY! Ask for donations. Check out Donors Choose or Go Fund Me to work to get your novel dreams funded. Have students purchase the books. Instead of a workbook fee, charge $15 to be able to get three novels for the year. If students choose to donate these books to your class, you will work towards getting your own class set. I mark all books with my stamp to make sure I get them all back. For free reading books in my class library are sorted into bins and each have a matching sticker to identify where they belong. Class sets of novels are numbered on the spine, to be able to easily see if one is missing. The book we are currently reading in Spanish, I only have enough books for my largest class. The procedure is at the start of class the first student takes the top book from the stack of books and passes it on. At the end of class, the books are passed back around my semi circle in my deskless classroom in order. They stay on the front table in my room. We do all reading in class and I rarely assign homework with the novels. If a student needs to, they can check a book out for the night. If I have enough books for all sections of the class, I check out a book number to each student for the duration of the unit. Just like a textbook, they can be fined if one is not returned. I have found they do stay in better condition when the books stay in the classroom, especially with lower level students. Lockers and bags are rough on the paperback books. The first step in planning is to make sure to buy any official teachers guide from the author or publisher. These guides are pricey, but worth their weight in gold if you would like to turn reading a novel into a full cultural unit. Next do a Pinterest, Google, and TPT search for teachers who have taught the novel and already have ready to use resources. Teaching your first novel will go much smoother with ready to use, teacher tested resources. Here are a couple blog posts to check while planning: How to Teach Your 1st Novel & 5 Tips for Teaching with Novels. My biggest planning tip and what has worked really well for me, is to create a large Google slide show for the whole novel. This is where I put chapter by chapter pre reading questions, during reading discussion and all activities from the guide that I plan to do. 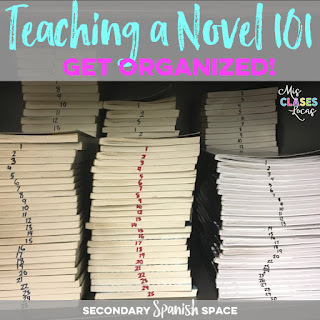 It is a lot of work to create the first time teaching the novel, but is a lifesaver once teaching the next time around. I post these slide shows on our password protected Schoology or Google classroom site, so when students are absent, they know to read the next chapter and do activities posted for that chapter. Since most of the slide show is made up of purchased teacher's guide materials, unfortunately I can not share them. These novel slide shows really help my planning and organization from year to year, as well as from class to class. As a department of one, I teach all levels, so having everything for one class ready to go, helps me easily transition from one prep to another. When posted during class, they also help to guide personalized questions while reading, and remind me to pause and discuss as we go. While teaching a novel, I like to front load the necessary high frequency vocabulary, as well as book specific cultural knowledge. I usually spend a week or two prior to actually starting a full class novel learning about the geography, historical context, and theme through authentic songs, movies, and other resources. Some teachers spread out a book over a quarter reading one day per week, but I have not found this successful in my classes. To keep students interested we usually spend two (50 minute) classes on the first couple of chapters, and then about one day on each of the rest. This means depending on other factors and book length, the actual reading of the novel in class takes about three weeks. While teaching the most important thing I have found is to make sure to mix up how each day is structured. Check out the posts Mix it Up! 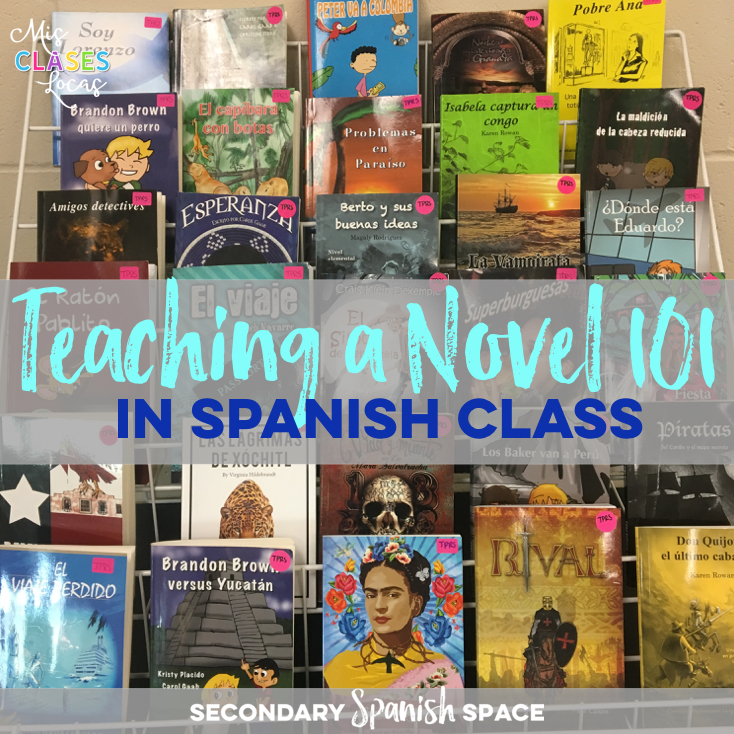 Reading TPRS novels as a class or Spice up your novel for ideas. We typically read the whole book in class, but change how we read it each day and even each class. I always read the first chapter to the class to try and really hook them in. After that, I like to give options, and even if most want to read alone, I give the chance of reading with the teacher. Giving options on any given day such as read alone, with a partner or with the teacher is a great way to differentiate and try to reach every kid. On a typical day we start by reviewing what happened the chapter before. We might then intro a couple new key vocabulary words to the next chapter using PQA, charades, or just using them with actions or TPR. As a class I usually project a couple personalized questions to get students related to what will happen and then we will read. While reading, I project comprehension, discussion or personalized questions and then stop to talk about them as we go. If students read on their own we will gather back to discuss as a class. If needed we will do extension or complementary cultural activities from the teacher's guide to expand on the chapter. It is all about checking for comprehension often and knowing when students are ready to move on. There is no need to beat a dead horse, so if students are over a book, you can speed through, even letting students finish on their own. 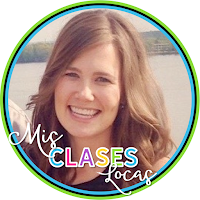 I want to make sure to keep student's passion for Spanish alive in a positive way. There are many performance based ways to assess a novel. I typically have a couple smaller reading and listening assessments during the book and a summative interpersonal and writing at the end. Check out How to Assess a Novel for a variety of ideas beyond the multiple choice test. Each time I teach a novel it gets easier and better. With experience I know what vocabulary, concepts or cultural disconnects students had the first time, so I prepare for those in advance with front loading. This means that before we event start a novel, we usually spend a couple weeks introducing the novel with authentic films, resources, music, geography, and culture, as well as high frequency vocabulary that is essential to the comprehension of the novel. I have said it before, but there is no such thing as starting with a novel that is too easy. I personally like novelas with simple, high frequency text, that have connections to deep culture, especially to start building confidence. If you would like to learn more about teaching with novels I will be presenting at CSCTFL in Chicago on Saturday, March 11 at 9:30 a.m. Fluency Matters also put together a great list of CI Sessions to attend at Central States, which can be found here. Have you taught with novels in your Spanish class? Please add your experience, tips and resources below! Keep learning & growing every day. Allison, wonderful post! Thanks for sharing your expertise. One of my favorite novels to teach is "Cuentos con sazón" by Scholastic. Reading is such a great way to engage students. Also, if anyone is looking to start a reading library in their classroom, I just wrote a blog post with lists of books to purchase. Slightly different from TPR texts, my list has children's books which my students really enjoy. Here's the link in case anyone is interested: http://theworldlanguagecafe.com/create-reading-library-world-language-classroom-part-2/. Allison, great post! I'd like to add to your FVR library with a few of my own gems, which teachers and students seem to really like. For Spanish 1- La clase de confessiones- although short of a cheeky love story, it totally present tense and has tons of classroom vocabulary. The nosy teacher tries to play matchmaker, and everything goes awry (confession, I actually am trying to get to kids in my school to go to prom together, both are dateless and nice kids). In part 2, the, beset with his own issues, tries to return the favor to the teacher... it gets really interesting! I wrote earlier this year to give students more contact with classroom vocabulary and verbs. They loved it and ask me to come up with a part 2, which is La Bella Mentira. For my Spanish 3 class, I used La calaca alegre, which was a lot of fun. The students took turns playing the character in our in class- consulturio. At one point, we divided the class and had half the students read one chapter, and the other half read the other. Then, they interviewed each other about what happened. For my Spanish 4 class, I wrote "Las apariencias engañan and El muerto en el armario- major teen drama, but it focuses on the subjunctive. One of the activities I did, which I later used for El Internado, was have students review the chapter on a character's death and do a CSI activity. This helped them to review plot, vocabulary and use the grammar structure to make recommendations one how to proceed. I just also ordered "Todo que brilla- it looks good and I can't wait to use it! It seems really interesting. In my FVR, I have Frida, La hija de sastre and I use a ton of Maryglasgow magazines. They have very good articles and the website is replete with activities. How much of the two week pre-reading activities are done in the target language? Or do you set it up like any other 90%+ lesson? It may seem like a weird question, but with some of the historical context, I'm wondering if you just have them read something in English to help with knowledge base.